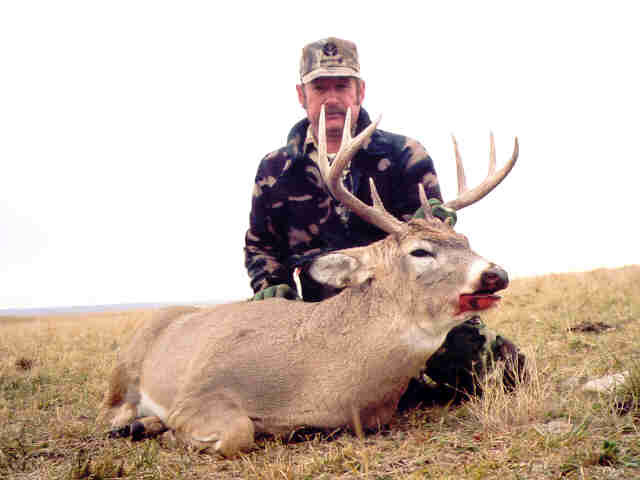 MARK MASTILAK of Moon Twp, PA hunted with us early in 2005. We were lucky enough to have super snow cover for tracking and Mark was pleased to get this good tom on the second day of his hunt. SCOTT BURNETT of Cut Bank, MT, made the short drive up to Alberta to get in on a cougar hunt with us. He had to make a second trip due to deteriorating snow conditions, but was rewarded with this great cat for his efforts. Final Boone and Crockett score is 15 2/16''. Another one for the book! 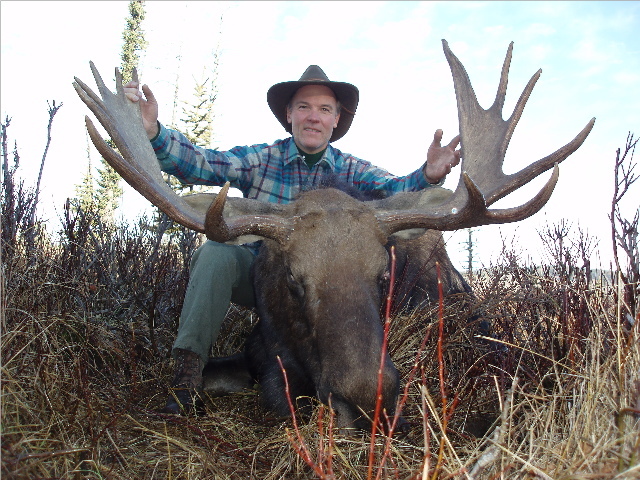 JOHN COTTA of Exceter, CA, was enthusiastic about taking a moose using his bow. When we spotted this big bull, John made a great stalk and an excellent shot to get himself a classic 53 inch Shiras bull! SUSAN TUOHY of Alpena, MI, made an outstanding shot across a canyon to take this beautiful buck on the first day of the season. 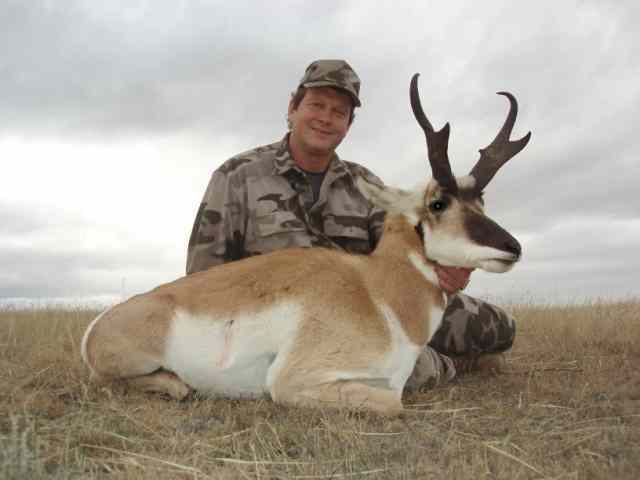 MIKE WILMOT, of Livonia, MI, harvested this awesome pronghorn buck on the first day of his hunt. We'd like to say how much skill was involved, but mostly he's just plain lucky. Not to mention photogenic! 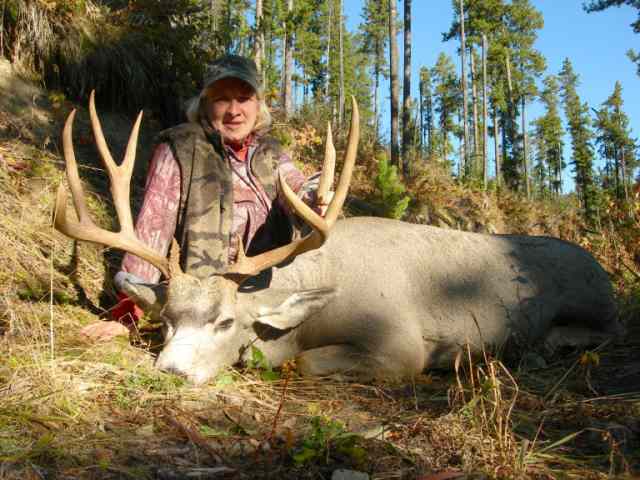 SUE WILMOT Livonia, MI came with husband and hunting partner, Mike. Not to be outdone, she made a perfect stalk and shot to bring home this nice buck. PATSY MARCHEL of New Boston, MI came to take in her first big game hunt. 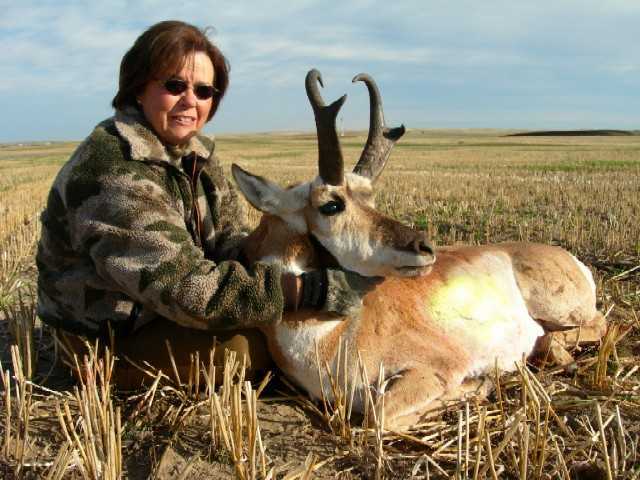 She harvested this nice antelope on the first day using a .257 Roberts with a 100 grain Barnes X bullet. Way to go Patsy! JIM McDOWELL of Howell, MI took a great mountain lion with us last year. 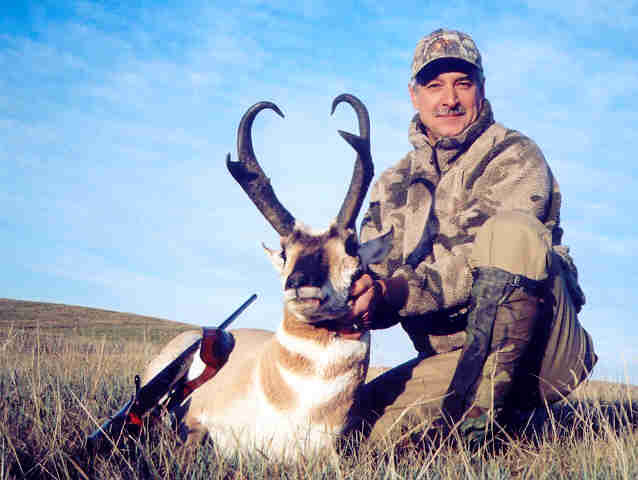 He came back to Alberta and was rewarded with this nice antelope on the first day. 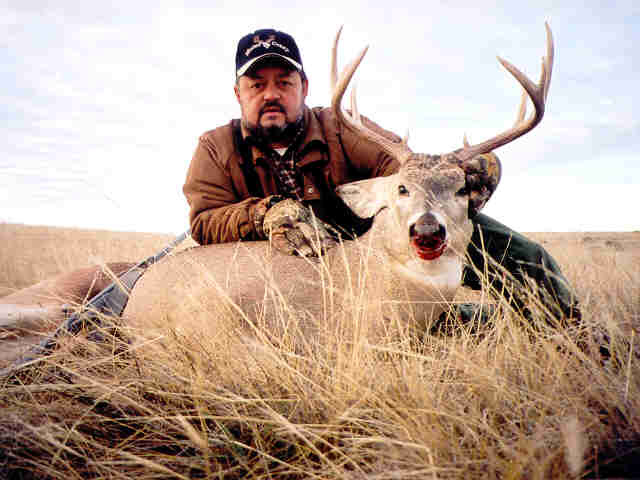 BILL WILSON of Missoula, MT, has hunted with us several times in the past. This year our longtime friend took a nice 45" Shiras bull moose on the second day of his hunt. Then the work started...there was no time for naps in the sun on this day! He was using a Martini & Hagn made custom single shot rifle chambered in .375 Dakota with a 270 grain Barnes X Triple Shock bullet. BOB LOSS of Pittsford, NY, joined us along with his friend Bill (above) for our October moose hunt. On day number four we were packing out moose again. The weather was a little warm for hunting but it was beautiful. 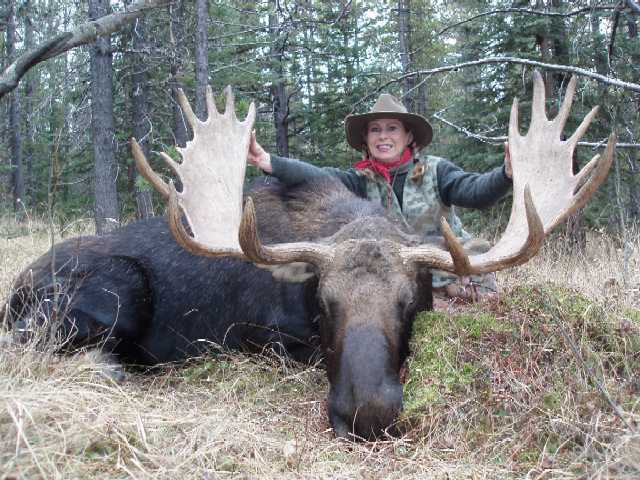 Tracy used her time off for a day of moose hunting before October was through. It proved to be a very productive day indeed as she connected on this great bull. As always, she was using her .257 Roberts with a 100 grain Barnes X bullet. BILL FANT of Falcon, MO, scored on this nice muley buck just before dark on the first day of his hunt. DAVID ARTHUR of St. Charles, MO, made a great shot on the first day of his hunt to get himself his second Alberta muley. ROSS JACKSON of Golden, CO, was able to connect on this nice buck for his first whitetail. Ross also took this mule deer before his hunt was over. ERVIN PHIPPS of Elm City, NC, came on his third mule deer hunt with us. 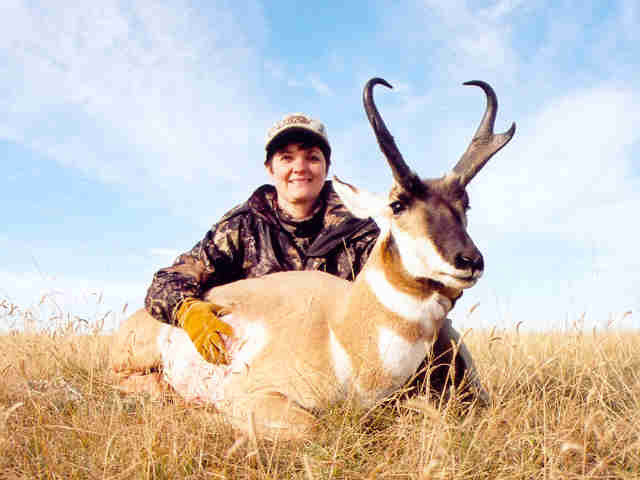 This magnificent mule deer buck exceeded his expectations, easily making the Boone and Crockett record book. 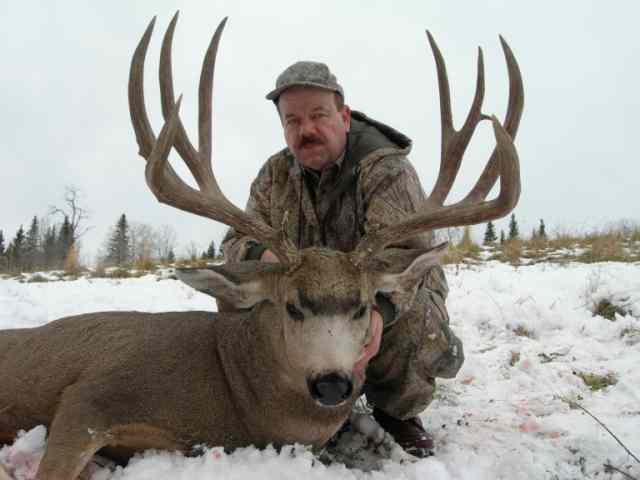 MIKE FLASHMAN of Bellevue, ID took this big, heavy-based old buck late on the first day of his hunt. He was lucky enough to get his first whitetail called in to him the next day, making for an exciting time. The last day was available to do a little wingshooting with "Buster", to finish up the hunt. RON WARD of Sparks, NV took this whitetailed deer the third morning of his hunt. He harvested this fine prairie mule deer hiking through a beautiful coulee that same afternoon. UBALDO LOPEZ of El Rodeo Hunting Lodge in Sonora, Mexico, took this super heavy "muy grande" muley buck just a couple of hours after taking his first whitetail (below). Congratulations amigo! He used a .280 Remington with 140 grain Barnes X bullets. 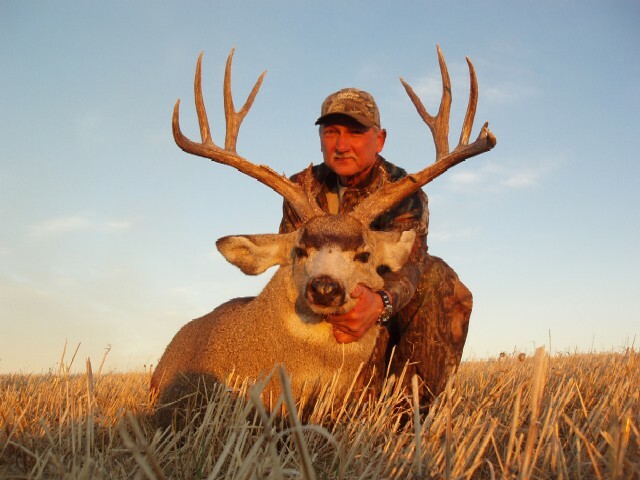 We love hunting Desert Mule Deer and Coues Deer with Ubaldo in the Sonoran desert. We'll be going back next year and you can join us when we do! Contact us for details. COREY HYDE of Ithica, MI took this nice whitetail buck, (just before it ran him over) and followed up a day later with the muley below to finish off his "double header". He ended the week shooting Hungarian partridge over "Buster". Tracy was busy this year, in addition to the great moose she got in October (see above), she also took this nice muley on the last day of the season, using her .257 Roberts with a 100 grain Barnes X bullet. And yes, we finally did get cold and snow, the temperature dropped about 80 F degrees from the week before. Thanks to everyone who joined us in 2005 and made the year another memorable one for us. We truly enjoyed sharing your success with you! A few words of appreciation are in order to all those, whose contributions helped make everything possible. Arnie Newton, Billy Franklin, Carl Ellingson, Dale Silbernagel, Danny Fieldberg, Deb Newton, Don Grayson, Gary Villemaire, John Gordon, Kim Grayson, Toni Grayson and Tony Kondel. We couldn't have done it without you! Send us an email to let us know what you think of our Photo Albums, our website or just to say hello!